LLG Cultural Development Centre was formed in 1985 to commemorate the most respected Chinese educationist in Malaysia, Mr. Lim Lian Geok. 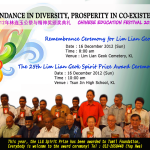 It was the date Mr. Lim Lian Geok passed away and regarded as ‘Chinese education festival’ by Chinese educationists. LLG Cultural Development Centre Berhad will be organising a “LLG Run” on Sunday 28th October 2012 at National Stadium, Bukit Jalil. It is co-organized by Taman Bukit Jalil Running Club and we are targeting approximately 5,000 runners to take part in the event. We are looking for sponsorship from the public and commercial sector. We would be most grateful if you would consider supporting the run in contribution of any kinds. Your support will ensure the success of this meaningful and healthy activity. 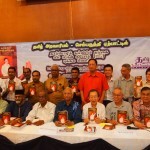 Cheque / Bankdraft : Pay to “LLG Cultural Development Centre Berhad”. Send it together with the donation slip. Cash : Please hand in cash with donation slip to us and to collect the receipt. 321-D,Lorong T.A.R.Kanan(1),Off Jalan Tuanku Abdul Rahman,50300 K.L.